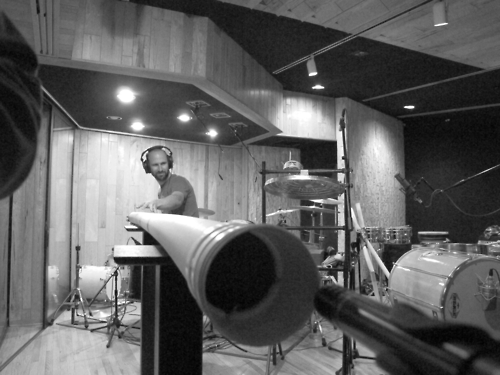 The Hollywood blockbuster’s percussion specialist talks guns, drainpipes and other instruments. The posters leap out at you from the side of every bus and billboards on every corner. And it’s no surprise, with an avalanche of five-star reviews and a cast of Hollywood hard-hitters. Looper is being hailed as the film to see in 2012. And that makes Chris Mears, percussion specialist and collaborator on the film’s score, very happy. Looper, starring Bruce Willis, Joseph Gordon-Levitt and Emily Blunt, is an intense time-travel, sci-fi thriller, in which a hit man from the future travels back in time to kill himself. It’s definitely not conventional. And the same can be said for the score, which was performed on a base of their own custom drum section, made up of their recordings of implements including a microwave, fans, generators, and the railings outside the apartment where Chris stayed in LA with Nathan Johnson, the film’s composer. They layered sample upon sample, slamming car doors, rattling chains and recording the sounds from a pocket-watch and a gun used in the film. Using a sample pad, they manipulated the sounds to act like a traditional drum kit and added Chris’s live performance over the top to give it an alive, dissonant edge. When Nathan’s cousin, Rian Johnson, invited Nathan to work on his debut film, the neo-noir Brick in 2006, he asked Chris to be part of the team. Armed with a microphone and a computer, they recorded themselves bashing a radiator with a whisk, playing a piano with screws hanging from the strings and running their fingers around the rim of wine glasses – the “winophone”. The result was a haunting, beautiful soundtrack to a film that won the prestigious Sundance Festival’s special jury prize for originality of vision. Nathan and Chris’s music has become a fixture of Rian’s movies. Their score for his next offering, The Brothers Bloom, was more traditional – Chris calls it a “vaudeville, old gypsy-type feel” – and Looper is their third project together. Looper is in cinemas now.